Since my new Regency brocade gown is very on-trend for England’s historically imperialist love of all things exotic, I figured I’d make a matching turban to really set off the outfit. After making a moderately full skirt for my gown I still had a bit of fabric left, which included a decent amount of gold embroidered border, so I gave it a shot. I didn’t want my head to get too hot, so I opted out of the full-cap turban. Instead, I wanted to do a structured ring-shaped base with twisted fabric around the outside to vaguely resemble a turban. Ideally I would’ve gotten buckram for the base, but I didn’t have any and there was no time to order any. Instead I found myself a sheet of that plastic grid stuff you use for hooked-yarn projects– I cut out two 1.5″ wide strips and stitched them into a ring. I covered the ring in a layer of gold sari border, whipstitching the edges on the inside. To attach the skirts to the bodice (the last major construction step) I worked with each skirt separately– the underskirt was narrower than the overskirt, and I wanted to pleat them separately so they’d flow more gracefully when I moved. I only achieved limited success with that due to the stiffness of the hem trims (as noted earlier), but I did the best I could. I pinned and basted each skirt to the bodice before machine-stitching the final waist seam (praying I wouldn’t screw anything up), and whipstitched the bodice lining over the seam allowance so the inside would be neat. First I removed the pallu of the sari (I admit I cringed at the first cut of the shears– what if I screwed it up?) and cut it lengthwise to make two even panels. I immediately ran a zig-zag stitch along the cut edges to prevent fraying. (I actually did this every time I cut an edge that wouldn’t be encased in fabric) The panels aren’t exactly the same– the design is upside-down on one piece because the pallu wasn’t vertically symmetrical, so when I flipped the top half over to act as the hem it didn’t quite match. I figure no one will notice, since that part will be down near my ankles anyway. I made an underskirt out of dark blue cotton voile, making it only as wide as the pallu pieces at the bottom. I tapered the front panel slightly, but cut the back panel as a rectangle so I could do some– but not too much– pleating in the back. The goal was to reduce bulk at the waistline, but I needed at least *some* pleating in back so both layers of the skirt would fall into nice folds. For the front panel of the overskirt I cut two 34″ skirt pieces from the part of the sari directly above the pallu– like I did with the cotton Regency sari gown, I wanted to use the side borders to form a double-width embellishment down the center front of the skirt. (Well, almost double-width– I decided it looked better if I omitted the border edges down the center) Additionally, the borders on this portion of the sari weren’t just brocade, they were also embellished with beads, so I wanted them front and center. * Once they were cut out I stitched them together to form a trapezoidal front skirt panel, and attached another long piece of border to the straight bottom edge. This would prove to be a mistake. I’m taking a quick break from the Embassy ballgown to post about another project I recently started– a Regency ballgown that I’m going to wear to a dance weekend at the beginning of April. While I do plan on wearing my burgundy dupatta open robe for the first night, I’m ready to make something new for the Grand Ball the next evening! I do love beautiful textiles. Even when I was a kid I’d go to fabric/craft stores and buy beautiful ribbon by the quarter-yard just to have it, not necessarily to make anything with it (yeah, the people at the cutting counter just *loved* me, I’m sure). And some of the most beautiful fabrics in the world are Indian saris, at least in my humble opinion. I was on a sari-buying kick a while back, figuring that I’d use them to make Edwardian or Regency gowns, and while I’ve managed to use a cotton sari and a silk dupatta, the rest have languished in my closet for far too long. But no more! For this project I’m going to use a gorgeous navy blue and gold sari– it has a fabulous pallu that’s not only brocaded, but also embroidered with bullion thread and sewn with tiny pearl beads. It’s just begging to be shown off at a fancy event! One of the toughest parts about creating a costume is fabric– for an existing character the problem can be finding exactly what you need to replicate a specific look, but for a costume where you’re creating something out of whole cloth (pardon the pun) it can be even harder to choose among the vast array of available fabrics to decide what you like best. And then there’s budget. I’ve got a relatively limited one for this costume, and unfortunately for most historical-style garb you really need something with a nice weight to it (translation: something expensive) if you want it to look good. I thought about stretch velvet, but I don’t have a lot of experience sewing knits and it’s pretty expensive if you don’t want to use panne (I don’t, it makes everything look like a cheap Halloween costume). I looked at saris, figuring they’d have some nice patterns and embellishment to work with, but they don’t often come in gray and almost never with silver accents. 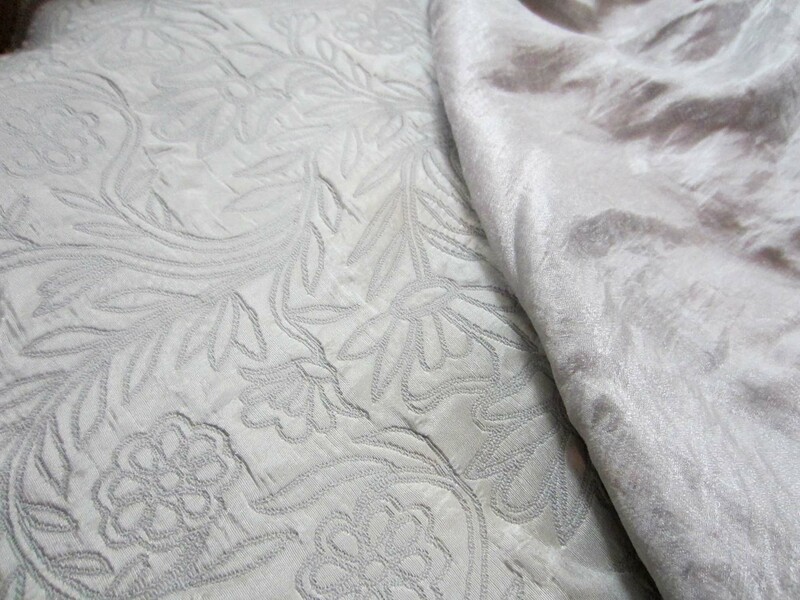 Most fashion fabric brocades looked too shiny and/or too modern, plain taffeta was too boring, and it was tough to find home decor brocades in solid gray. When I finally found a 4-yard lot of 54″ wide muted silver embroidered drapery fabric on eBay for $18 (including shipping!) I couldn’t pass it up. I know fabrics don’t always look as good in person as they do on screen, but this ended up being gorgeous, and luckily not too stiff to drape nicely. According to my pattern it’s a little short to get a whole dress out of, but I’m hopeful that with judicious fabric placement I can get the majority of my dress cut. For the gores and sleeve puffs I’m using several yards of silvery gray fabric gifted to me by a friend and which is basically “mystery fabric.” I’m fairly sure it’s polyester, it has a subtle texture to it and it drapes well, but apart from that I have no idea. It coordinates perfectly with the embroidered fabric, though, and is heavy enough for a skirt gore but light enough for a sleeve puff. It’s miles better than any of the other options I was looking at online, so I’m thrilled to have it. Since I’m dealing for the most part with drapery rather than apparel fabric, I’m going to line the whole dress in to mitigate the roughness of the wrong side. The pattern doesn’t call for a lining, but I’m sure I can figure something out. I’d intended to go with white, but ended up picking out a pale lavender lining fabric instead– it coordinates with the gray and I thought it would be pretty, even if no one else will see it.